AS IT STANDS: It's Political Deju Vu Time Folks! It's political deju vu time. You may think it's 2018 and the midterm elections are coming up, but the Republicans think it's still the 2016 election. Rick Wilson, a Florida-based Republican strategist and ad-maker, said the GOP's strategic bet is that shifting the focus back to Clinton "lets Republicans and Donald Trump pretend like the 2016 campaign is still going on." Conservative news outlets have never stopped covering her with election-year intensity. Democratic campaign officials say the GOP's throw-back message reflects the lack of an effective new one in what promises to be a tough year for Republicans. They may have a point, but it still energizes the haters in the party. 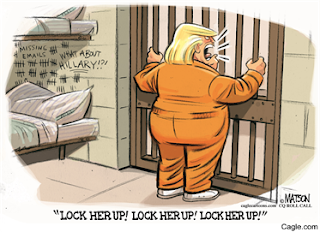 Trump, who is already holding 2020 campaign rallies in key presidential swing states feature "lock her up!" chants. If you've been following the GOP it's like the election never ended. Some 17 months after Election Day 2016, Fox News is still devotes roughly equal time to Trump and Clinton, according to an analysis by the liberal media watchdog Media Matters — despite the fact that one is now a private citizen, and the other president of the United States. The question is how prolific Trump's base really is. The idea that they will rise in great numbers in November, united in their hate for Hillary is a flawed one in reality. The Democrats are getting their message out and it's all about the here-and-now. Some are running on "hate Trump" platforms, but most have turned to messages that appeal to the majority of Americans. It's no coincidence that the GOP has made villains of two women, Hillary Clinton and Nancy Pelosi. It's a reflection of the male-dominated Trump crew of puppets. I'm looking forward to the day that Mueller exposes Trump's corruption and collusion with the Russians. I expect the chants of "Lock him up!" will ring through every city in the nation!